Caption slip reads: "Photographer: Mitchell. Date: 1956-01-20. Reporter: Gus Newman. Assignment: Transportation hearing. 81-82-69-70-35-36-75-47: Mayor Norris Poulson. 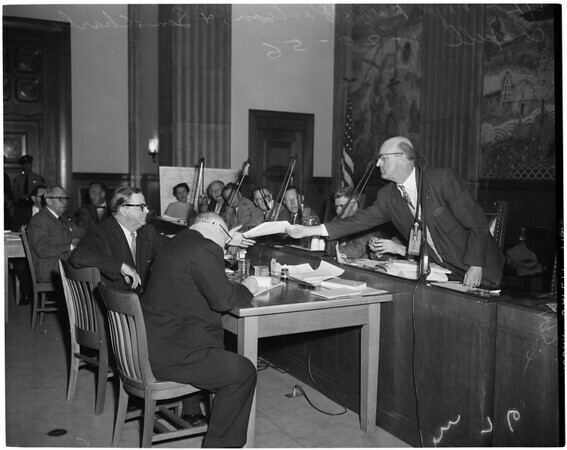 76, L to R: Mayor Norris Poulson receives contract from Senator Charles Chapell. 48-45: Ex-Mayor Fletcher Bowron. 46: Martin Pollard on board of M.T.A."